New treatments, new tests, and new insights into health and disease have resulted in an unprecedented explosion in medical terminology. The American Heritage Medical Dictionary provides students, health care professionals, and general consumers interested in medical vocabulary with a comprehensive reference that reflects the most recent developments in medicine and health care delivery. More than 45,000 clear, concise definitions are included, covering diseases and conditions (avian influenza, gender dysphoria), treatments (cosmeceutical, fusion inhibitor), and microorganisms (norovirus). Hundreds of entries for commonly prescribed and over-the-counter medications are also featured. Informative illustrations and tables complement the text. Entries are written in a straightforward style at an appropriate level of technical detail without the inclusion of overly academic terminology. Sophisticated enough for the medical professional but accessible to the general user, this book demystifies the complex vocabulary of health care. Biographical entries describe the contributions of leading scientists and physicians from ancient times to the present. 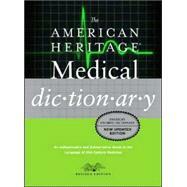 With its comprehensive treatment of all medical specialties, including alternative medicine, genetics, and geriatrics, The American Heritage Medical Dictionary is an indispensable reference for anyone interested in modern medicine. The Editors of the American Heritage Dictionaries and of other reference titles published by Houghton Mifflin Company are trained lexicographers with a varied array of interests and expertise. Most of the editors hold graduate degrees and have studied at least one foreign language. Several have degrees in linguistics or in the history of the English language. Others have degrees in science or sometimes other disciplines. All the editors familiarize themselves with the vocabulary in specific subject areas, collect materials on new developments and usage, and work in association with consultants to ensure that the content of our publications is as accurate and as up-to-date as possible.